Shower of Roses: Curriculum Sale Blog Hop :: Thank You & Giveaway! I hope you all enjoyed browsing though all the great books for sale on all the various blogs or, if you joined the link up, were able to pass on some of the books you no longer need to new homes during this year's Online Curriculum Sale Blog Hop! I was so excited to pass on so many of our own books (post one and two) and help my mom sell some more of hers as well. (I did just reduce the prices on some of her remaining books and will continue accepting requests and forwarding them to her.) I'm headed to the post office right now to mail the rest of the orders that have been completed! 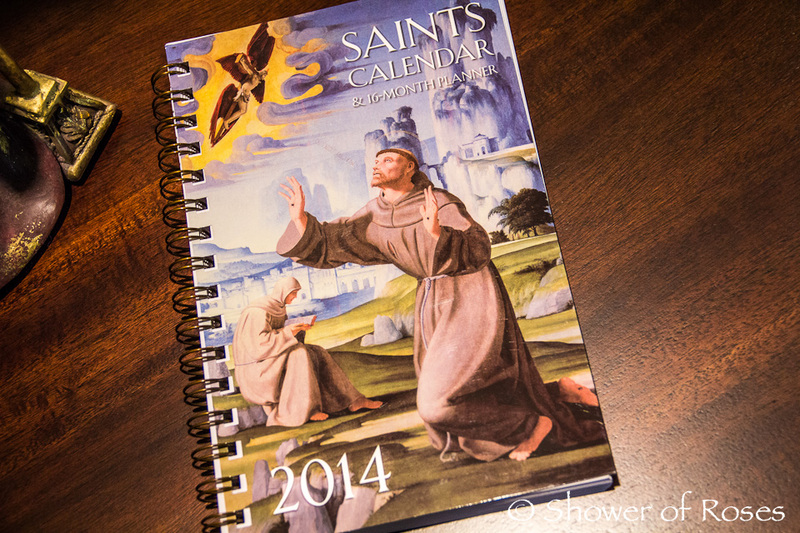 For anyone who would like to be entered in the giveaway for this Saints Calendar, just leave a comment on this post. Make sure your email is either linked on your profile or included in the comment so that I am able to contact you if you win. If you participated in the link-up by hosting a blog sale on your own blog, purchasing books from one of the links, or helping to spread the word on your own blog or Facebook, please leave a second comment for a bonus entry in the giveaway! Comments will be closed Monday night and I will update this post and contact the winner on Tuesday. In the meantime I want to ask you all to pray for Rita Davidson, owner of Little Flowers Family Press, and her family. Their home and business were just destroyed by a house fire which they barely survived. They did not have insurance and lost everything. If you can help you can find the link to the Facebook page for the Trust Fund for their family here. UPDATE: Congratulations to Amy Caroline! It looks like it ended up being a good thing that your first comment didn't work. :) I'll get your new planner to you soon! God bless you, Jessica, for your generosity! I would be thrilled to win this calendar! I am anxious to see your Alphabet Posts on the letter "C" and beyond with Snuggles! I always look forward to reading your new posts. Thank you for all that you do! I love these planners! I gave one as a gift last year, to a godchild's mother. I figure at his ripe age of 1, the people who influence his faith the most should have tools to help with his catechesis. I'm using today to finally catch up on emails and shipping from the book sales. Thank you for hosting the link up!! Thank you also for your prayers with my FIL's passing, it was a beautiful Mass and we were very blessed to have had the time we did with Grandpa. I would love an entry for the planner! It would definitely come in handy planning out the school year. Adding my second comment for another entry! I was able to get a couple good books from the sales. Thanks so much for hosting!!!! Thanks Jessica for hosting the link up. I found a few nice deals for our family on several of the link-ups! Take care! I would truly love to win the planner! We will be praying for the Davidson family, what a tragedy! I'd love to win this planner. I'm lost without one! I found a book I had been looking for thanks to the curriculum blog hop. Thank you for this opportunity - I love planners! Thanks for hosting this giveaway. I'd love a chance to win. I would love to win this lovely planner! I haven't bought the planner yet, so would love to win! A beautiful planner reflecting our beautiful faith. Thank you!! I was able to purchase quite a few books that I will be using for school this year! Thank you!! I was able to purchase books from two of the sellers. I've had my eye on this planner. I love the cover art! St. Francis is a favorite in our home. Thank you, Jessica! Thank you also for hosting the Curriculum Sale Blog Hop, where I was able to buy quite a few books and things for my home-school. God bless you! I would so enjoy using this beautiful Catholic planner! Thank you! will be praying for sure! thanks for a great blog. I had this in my Amazon cart, just haven't ordered it yet. Would love to win it! you do. God Bless! hahs@bellsouth.net. These calendars are really great! Thank you! Well I had hoped to participate in the book swap, but we moved from our home in TN to MD over the dates for the swap. Maybe next year! I love the Saint Calendars! godscanvas - I'm in Baltimore County, MD, in what part are you? Great job on the book sale! We didn't grow up with a bunch of books in the house and I am trying to change that with my family. You are such an inspiration! God Bless you! Looks like a beautiful calendar & planner! I keep looking at this planner, but haven't made the plunge to try it out. Thank you for the giveaway! Thanks! And prayers for the family too. The planner looks wonderful...might help me be more organized? I would love to win this planner. I have yet to find one that works for us. The "Simplicity" one was confusing, but this one sounds better. Thanks! I would like to win this lovely planner. Thank u for your blog! I am so happy when it's in my inbox :-). I would LOVE to win this planner! Would love a chance to win the planner! Also ordered from you and another curriculum sale blog hop participant! Thanks so much for hosting the blog hop! And thanks for the opportunity to win the planner! Also ran a sale on my blog! Thanks! Thats heartbreakin to hear about Rita and her family - especially with no insurance. They will definitely be in our prayers! I wished we could have participated in your sale - but we are too far away (in Colombia). Would love the chance to win the planner! Thanks and God bless! PS my email is velasquezcorkeryfamily@yahoo.com! Would love a St. Francis calendar so much. Wonderful giveaway! Thanks. sarahcpotter at gmail dot com. 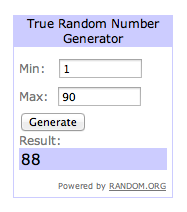 Please enter me in your wonderful giveaway, Jess. What a cool calendar! Thank you for hosting your curriculum sale and the Saints Planner giveaway. I LOVE this planner! I was so disappointed to miss out on it this past year when TAN sold out of them early. I would be thrilled to win the new one! God bless you and your family, and we will keep the Davidson family in our prayers!! Here's my second entry for purchasing books from your blog sale. God bless! Your blog has proven such a help to my family! Prayers to Rita and hers. This planner looks fantastic :). I love your blog and would love to win the planner! And a second entry for purchasing through the blog hop. Thank you for hosting this! Thank you for the opportunity to win such a lovely Calendar and thank you for a beautiful Blog that i enjoy reading ...It is a daily "Day Brightner"
What a wonderful planner. St Francis will be our Patron Saint for our school year this year! What a great planner, thank you again for everything you do on your blog:) It has been a true blessing, I can't wait to get all our new books!! Please enter me to win! Would love this! I purchased a book from your sale. Ugh! I tried to post a comment earlier from my iPad and it didn't work. Well, enter me, please! It looks amazing! I would love to win this journal. Thanks for all you do! I just saw this post and would love to be entered in the giveaway if it's not too late. Thanks!